I have been daydreaming about customizing a “ghost” scooter… white EVERYthing that can possibly be white. I realize there are some things that can’t be white, but I could powder coat the engine… maybe the pipe. Here’s my problem, I can’t find all white tires. I’m looking for some 16″s. The Innova / Desser distributor in the USA isn’t carrying them any more. They had a bunch of colors. 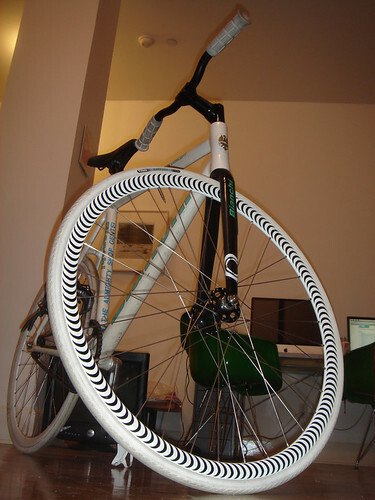 Schwalbe makes the Fat Frank in white, but only for bicycles. Same thing with Zaffiro and a few others at this store. Pirelli had some off roads. Do you have any suggestions? Maybe someone who can do a short run of white tires? Good shot! But, the closest size they have is a 20" and it's an old clincher style. I need a modern 16 inch. Sweetskinz are starting to move from just bicycle tires to other things. Their website makes it seem like they can print nearly any design on any rubber surface. I can only imagine what the cost would be for a set of one-off motorcycle tires. The down side is that the design would wear through on the tire. 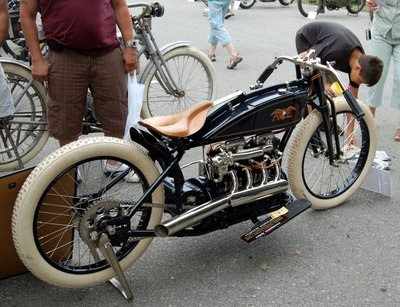 Instead of powdercoating the exhaust, have you thought about wrapping the headers? What kind of motorcycle are we talking about? Err…sorry. I meant scooter. I saw 16 inch wheels and thought motorcycle for some reason! Also that picture planted it in my head! Hey W Lincoln! I'll check out the Sweetskinz to see how they work. As for wrapping the exhaust, that miiight be a possibility. If you shoot me an email, I can show you the scooter I'm talking about and see what you think.